hey Mark- any suggestions on substitutions for the LF442? exactly what i've been looking for! think it's pissible to "daisychain" this with another boost like board? thanks mark, you're the best as always. This is perfect. Just a simple, subtle mid boost fattener. This circuit could most definitely be used as pre-board for any circuit. Personally i'm thinking 'bout putting this in front of Compulator to get the perfect, always-on comp/fat/superfat box. Aww. Just a perfect mid/fat control board. I'm loving it. Truly a recommended build. At least with som other circuits after it. what IC did you go with miro? and damn you're fast with the taggin haha! I just tried on TL072, LF353 and LM833. If there is a difference, it's very very subtle. So. Any dual opamp will work fine. Actually. There is a slight difference. TL072 seems to break up a bit, as LF422 stays clean(er). and i don't have any of those lf422 :( how about 4558 or 5532? With those, i would prolly go with NE5532 instead of 4558. But that is just a gut feelin.. Datasheets say that NE5532 might be closer to LF422 than JRC4558. sooo, iv'e tried a few now and as you said miro the difference is very very subtle. though i find that the tl072 and ne5532 sound "cleaner" and more open to me then the rest i tried which was tl082, tl062, ad712. wonderful circuit, although i belive that some of the highs get lost when turning up the boost. any ideas what to put before or after this one to make it a solid addition to any other booster/eq circuit? Cool thanks for that mate. The TL072 is a low noise version of the TL082 and the TL062 is the low power consumption model which will have some drawbacks associated with using less power, so your results probably make sense in the respect. The NE5532 is my favourite opamp out of the ones we commonly use, everything I've tried it in sounded better to me, so I had to buy 50 from Tayda to keep me going for a while. Is it possible to replace the 1N5817 with a BAT85, just because i have these to hand and i want to build this one NOW !!! That's for polarity protection, so you could use 1N4001 or just omit it altogether by placing 9V source to 3rd row instead of first. 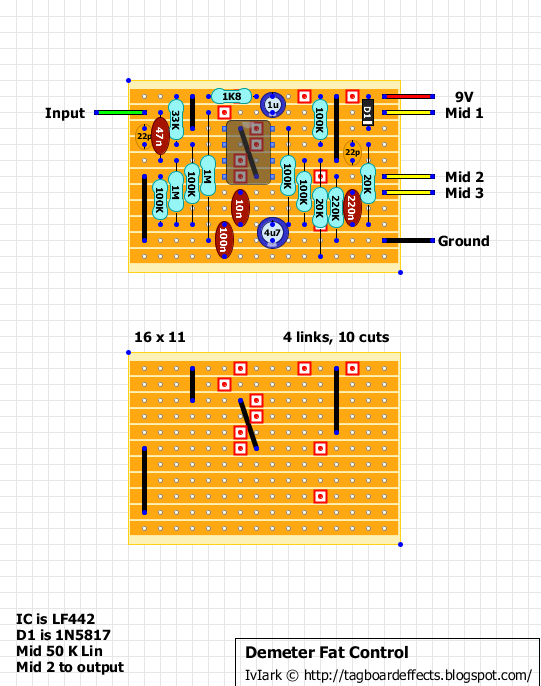 If i want to use buffer wiring...will the buffer switch be in the mid1? I haven't put any LED yet. Also I noticed the scratch sound when I turn the guitar volume knob, something like the crackling sound from Super Hard On. Other than these two problems, this pedal sounds really great. 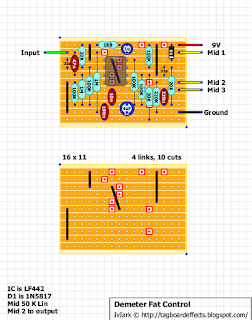 Try a pulldown resistor between the input effect and ground (1M-2M) and maybe change the pot. This one is absolutely fantastic. I just love the Demeter effects, I've now done all of the layouts from here available. And all are keepers. Like someone else said this one will be perfect in front of the Compulator. I tried probably 10 different opamps since I don't have an LF442 yet, but found that I like the LM358 the most. also build it!nice clean boost. i haven't played with it much yet but i think it's a very good boost to have. better than the s.h.o..
for me the best ic from what i have was 1458. 072 and 4558 were too dirty for what i wanted this pedal to be. strange thing is that my only one 5532 was the weakest of all.10 times smaller boost if i can say it that way.. I need some help. I build Demeter fat control and placed it in my strat as onboard mid boost. It sounds good when I want boost, but when I want clean tone it loose some treble, doesn't sound as my clean guitar. If I understand well - this pot blends buffered and boosted signal, so I wonder - is it possible to blend clean signal directly from pickups with boosted signal, to get my clean tone when roll of pot? Maybe I should use this Mini JFET blend for that? which i've build, you'll still won't get your original sound 100%. Thank you for replay. I wanted to know does it make sense to try something like that, so I will give it a try. I don't have much room for adding new components so I will try Mini JFET blend, it is really small. I already placed push/pull switch, so I can change to bypass anytime, but I would like to make it this way, to use only pot. Hi, i just tried this pedal build and i have a question : do you have to connect the ground of the battery to the input and output jacks? made this and i am planing to on-board install it along with a stratoblaster . after making this decision i read on tgp some guy did the same thing and he claimed its a great combo . BUT when testing it seemed to more be high end that is effected not so much mids . i did not have a 1.8k resistor , so i subbed in a 2 k , would i be better off subbing in a 1.5k there ? what gives ? i mean it really seems to be more of a treble boost atm . i know resonant filters there is a relation ship with R/c to freq , but i do not know more than that and with no schemo i was hoping a comment would help me avoid removing / playing around , but . . . either way thanks and yeah this is a cool circuit .